All transactions are safe and secure with a reliable history in online purchasing behind each of our associates. 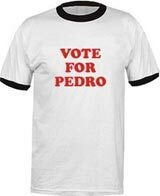 Buy the Vote for Pedro t-shirt to own Napoleon Dynamite clothing and merchandise. Pedro Sanchez is new to Preston High, but he's wasting no time in campaigning for Student Body President. You can show your support with this Vote for Pedro t-shirt that is available here as an affordable ringer T. Pedro is running against Summer Wheatly (Haylie Duff), your typical popular, blond elitist. Pedro campaigns with the promise, "Vote for me, and all your wildest dreams will come true." Wear this tee with your wig, glasses, and moon boots for a complete Napoleon Dynamite costume. In addition to the Vote for Pedro tee above, browse the Napoleon Dynamite Clothing Gallery for more apparel like men's and women's clothes, kids shirts or hoodies.